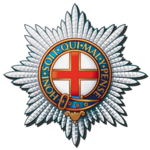 Welcome to the website of the Coldstream Guards 1815. We are a Military and Living History Society representing the Coldstream Regiment of Foot Guards as they would have appeared during the Napoleonic wars. If you have an interest in the history of this period and would like to know more please get in touch at coldstream1815@gmail.com or find us on social media. The Coldstream Guards have over 360 years of continued unbroken service, from the Civil War to the present day. Our aim as a Napoleonic re-enactment group is to portray Number 6 Company, 2nd Bn Coldstream Regiment of Foot Guards as it would have been at the time of the battle of Waterloo in 1815. We are family orientated and members are encouraged to bring wives, girlfriends and children to take part in events as from a living history perspective no military camp could have managed on campaign without them. These events normally take place over a weekend and are held throughout the UK and occasionally abroad. We take our hobby seriously and our membership includes people from a wide variety of backgrounds whose common interest is in being part of a team who can do something well together. We practice our foot drill and weapon handling throughout the year and we are happy to train anyone who is willing to learn. You do not have to be a perfect soldier to join us but you do need to be prepared to make the effort to be a good soldier. This is a family hobby and soldier's wives and families are expected to take on appropriate Living History roles with the group.